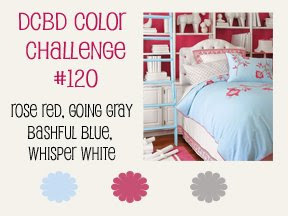 DCBD Challenge 120 - and 119 Challenge Winner! This week, we have a color challenge. Our design team has worked hard at their cards, please take time to check them out (links below). We are featuring another group of design team members this week. Here are their cards. 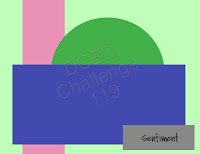 We had 16 entries into the DCBD #119 Challenge - we'd like to take a moment first to thank everyone for participating; and encourage you all to take a moment and try out our challenges if you haven't done so yet. Ladies, please contact Heidi with your mailing addresses; so she can send you your prizes! Our head Diva, Heidi was admitted into the hospital yesterday for an emergency appendectomy. Please keep her in your thoughts and prayers. She'll be home sometime later this evening; and back to posting soon. DCBD Challenge #119 & PRIZE!!! It's Wednesday ladies, do you know what that means?? Yep its Challenge Wednesday!! This week, was a sketch challenge. I designed this sketch for the gals, and hope that each one of you will try it as well (read below for exciting news!). The one twist with the sketch this time, is that each designer had to use products from Sale A Bration! This week, we are featuring three diva's; while we post their cards below, all the other diva's have worked hard on getting their cards done as well. You can click the links below to see the other diva's cards. Each one of you who creates along with us will have your creation voted on for some awesome PRIZES from the Sale A Bration mini: Brand new Stamp sets, DSP, & Ribbon. Be sure to get your card created and use Mister Linky below to post a link to your blog, so we can all see what you've created! We will be voting on Tuesday, March 24th. 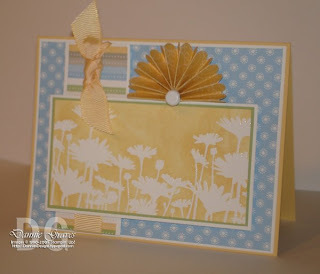 It's Diva Coffee Break Designs Wednesday and we have a challenge for YOU!! This weeks challenge is this going to be something a little different. Your creation will be with the BIG SHOT and any of the dies in the catalog. The possibilities are endless and I cannot wait what you have to share with us. Upload your cards to Mr Linky below so we can all see them. PLEASE. PLEASE take a look at the 4 featured Divas and also the rest of the divas blogs. Everyone has been creating hard for this sketch. Have fun and please keep coming back!! Each week we will WOW you with our challenges!! It's Diva Coffee Break Designs Wednesday and we have a sketch for YOU!! This weeks challenge is this super fun sketch. The possibilities are endless and I cannot wait what you have to share with us. Upload your cards to Mr Linky below so we can all see them. Each week we will feature 4 Diva's Creations so you can get some ideas flowing, and then the rest of the team will be below with links to their blogs. PLEASE. PLEASE take a look at their blogs also. Everyone has been creating hard for this sketch.